Combining history with adventure, taking part in this holiday will satisfy your interest in ancient history as you visit some of the many of significant sites as well as satisfying your quest for adventure as you visit Wadi Rum - adopted home of Lawrence of Arabia. In addition to all of this, there is still plenty of time to relax and a visit to the famous Dead Sea is included in the itinerary. :: Meet and assist upon arrival and departure. :: Exclusive services of expert and qualified Tour Guide. :: All local transfers in Jordan - e.g. airport, borders etc. :: Transport to and from sites of antiquities, museums etc. 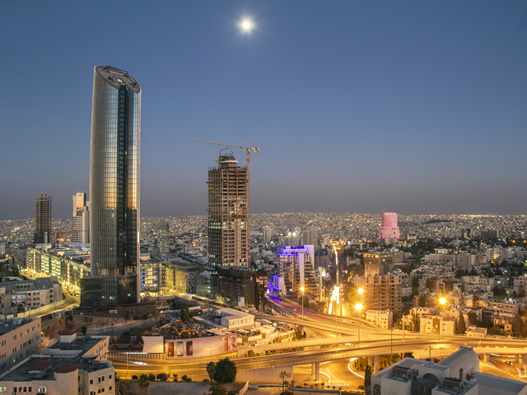 Enjoy a city tour of Amman, the friendly and modern capital of Jordan. Your tour will take you to the Amphitheater and the Jordan Folklore Museum, the Citadel and the King Abdullah Mosque. 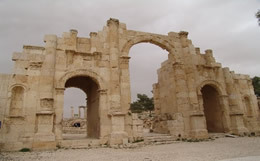 Jerash is the best preserved example of a Roman provincial city in the Middle East. Visit the spectacular forum, Roman colonnaded street, Nymphaeum, Artemis temple, St. Cosmos and St. Demeanors churches. :: Upon arrival to Queen Alia Airport or Jordanian Border our representative will meet and assist you through the customs and immigration procedures. :: Transfer to the hotel in Amman for overnight. 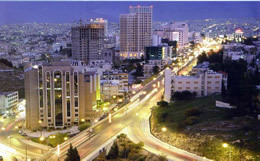 :: Following breakfast, enjoy a city tour of Amman, the friendly and modern capital of Jordan. This town is mentioned in the Old Testament as Rabbath Ammon and in Greco-Roman times as Philadelphia. Your tour will take you to the Amphitheater and the Jordan Folklore Museum, the Citadel and the King Abdullah Mosque. 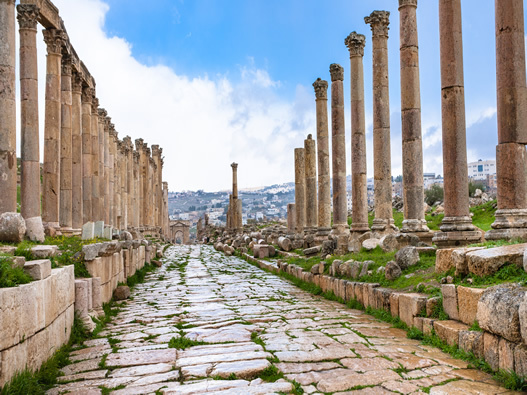 ::In the afternoon we drive towards the north of Jordan to Jerash, where you can see the best preserved example of a Roman provincial city in the Middle East. The tour includes the spectacular forum, Roman colonnaded street, Nymphaeum, Artemis temple, St. Cosmos and Demeanors church. :: The Dead Sea is our next destination. The Dead Sea is the lowest point on earth (417 m below sea level) and the largest "Natural Spa" in the world. The mineral-rich waters and mud flow with natural health and beauty benefits acclaimed globally. You will have the opportunity to float in the Dead Sea and experience the feeling of not being able to sink in water. :: Return to hotel - Overnight in Amman. :: Following breakfast depart for Mt. Nebo. This is the place where Moses gazed at the promised land before he died. 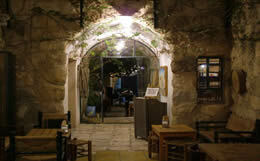 Your visit will include the old monastery where you can overlook the Jordan valley, Dead Sea, Jericho and Jerusalem. :: Madaba, where the famous mosaic 6th century map of Palestine in St. George’s church is sited. 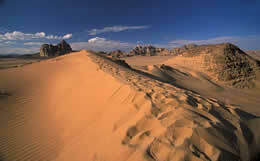 :: Drive to Kerak along the famous ancient biblical caravan route the King's Highway. You will have a short stop in Wadi Al-Mujib, a great wide valley, which sweeps your breath away with its magnificent geological formations. Kerak, the ancient, biblical capital of the Moabites, became well known for the famous Crusader castle that was built in 1132/34 by King Baldwin I of Jerusalem. Visit the castle and enjoy the amazing undergrounds halls and the museum. :: Leaving Kerak, drive to Petra. Overnight in Petra. :: Following breakfast depart for a full day tour to the Red Rose city of Petra, the most well known and iconic attraction in Jordan. 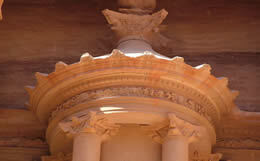 Petra was first established around the 6th century B.C. by the Nabataean Arabs - a nomadic tribe who settled in the area and laid the foundations for a commercial empire that extended into Syria. After the conquest by the Romans 106 AD Petra declined in importance. In the early 19th century the Swiss explorer Johann L. Burckhardt discovered the city again. :: Upon arrival you will begin an unforgettable trip to the canyon, the so called Siq, and then to the most beautiful monument of them all - the Treasury. The local guide will give a brief history of the city and among the other monuments you will see are Pharaoh's Castle, the Triumphal Arch, the Amphitheater and the Monastery “El Deir”. :: Return to hotel. Overnight in Petra. 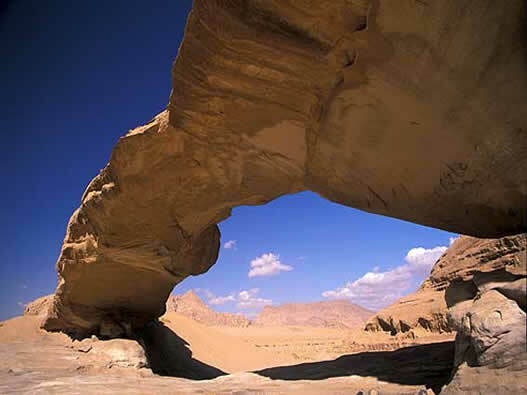 :: Following breakfast enjoy a desert drive to Wadi Rum where you will see the wild desert landscape which greatly fascinated the British liaison officer Lawrence of Arabia. :: A two hour Bedouin Jeep tour will leads you to Lawrence's Spring and to the sand dunes in Wadi Um Ishrin where you can find Nabatean inscriptions. :: Enjoy the spectacular view from Lawrence's House and then drive to the Barragh Canyon. Following this, we drive back to the Bedouin camp for lunch. :: As evening draws near experience the amazing sunset in the desert before the drive to Aqaba at the Red Sea. 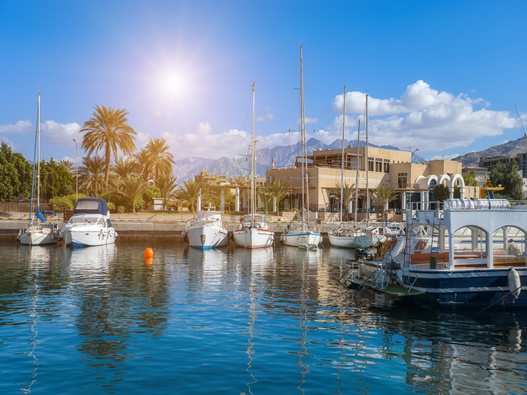 :: Check-in to hotel – Overnight in Aqaba. :: Breakfast taken at hotel. :: Assisted transfer to QAI Airport in Amman for departure. Madaba, where the famous mosaic depicting a 6th century map of Palestine is located in St. George’s church. The Red Rose city of Petra, the most well known and iconic attraction in Jordan. 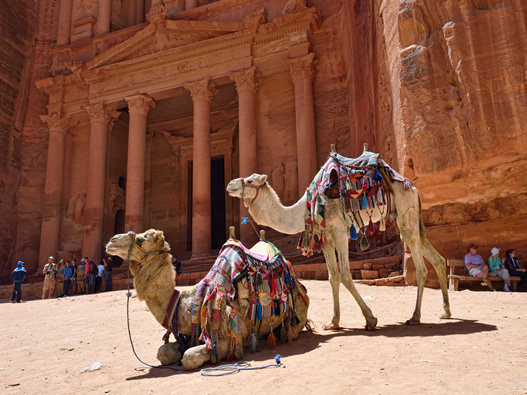 Petra was first established around the 6th century B.C. by the Nabataean Arabs. A two hour Bedouin Jeep tour will leads you to Lawrence's Spring and to the sand dunes in Wadi Um Ishrin where you can find Nabatean inscriptions.